I have had the honor of designing and setting up a website/branding for a very special politician...my husband. He is running for City Council in our town and I couldn't be more proud of him. He was made for politics! I believe he was created to make a difference in government and I am excited for this new chapter of our lives. I could go on and on but, I wanted to talk about the design process for creating his branding. Before I sat down to create some concepts and worked on design, I did some research on fonts, design, and colors used in political campaigns. Did you know that the font used for Obama's campaign is called "Gotham"? I read a ton of articles like this one and this one. I'm not sure why but I was actually surprised at how many people have analyzed this stuff...does a font really change your opinion about a candidate? A font is probably not the deciding factor when you vote but, it does matter! Your branding represents you and it might be your first impression to a potential customer. I will use various versions of the above design concept across his marketing but, the elements will stay the same. So, here it is, my very first political campaign design! 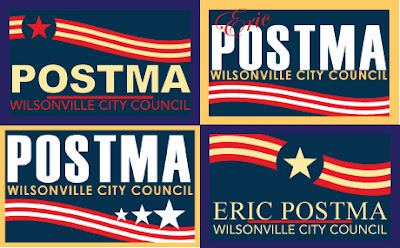 Feel free to check out Eric's website that we just launched, www.ericpostma.com. I hope this article will give you some insight about what goes into the design process when you hire a graphic designer...its not just clipart and comic sans, my friends, there is a great big world of fantastic design out there!